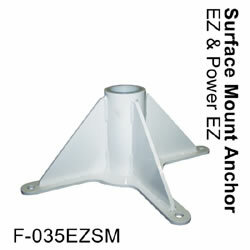 This stainless steel surface mount anchor is designed for the Aqua Creek Products EZ Pool™ Lift, EZ 2 Pool™ Lift, Power EZ Pool™ Lift, and Power EZ 2 Pool ™ Lift. The anchor assembly features a polyethylene (UHMW) pivot sleeve and an epoxy powder coated finish. The anchor also includes a tamper resistant lid and all necessary installation hardware.